Let’s talk for a a second about how much Italians must love the flavor combination of bitter and sweet. There is a whole Italian beverage category devoted to varying degrees of these two sensations: Amaro. The spicy-honeyed-bracing punch of the alcoholic beverages in the Amaro category range from “clear your sinuses” to barely bitter and quite fruity. Amari are made by the macerating herbs and spices in some kind of alcoholic spirit, and then adding a sweetening component- either cane sugar, honey, or molasses. Amari are also generally served neat, or with a little ice. 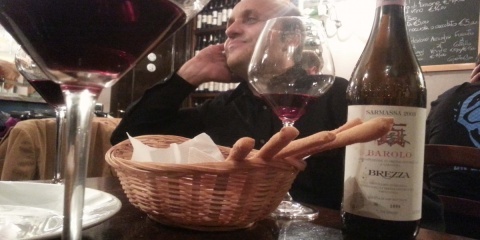 I have tasted hundreds of Amari… but had never encountered the “calda” or “hot” version before my last trip to Italy. Thanks to my friend Il Signore Luigi Pesce, I have a new way to enjoy Amaro. He ordered it on a cold, blustery afternoon in December- we were in a bar in some medieval Umbrian town. “Una China calda” (“oo-nah kee-nah cahl-dah”), he requested of the barrista. Immediately curious, I ordered one too. I had never seen Martini’s version of an Amaro: China Martini. China (pronounced “kee-nah”) is a reference to the bitter root chincona or quinine, which is the ingredient that gives the beverage its bite. The China Calda is made by heating a little water and the China Martini with the steaming wand of an espresso machine. It was served in little glass tea cups with a sliver of fresh orange rind. The vapors coming off of this highly alcoholic toddy were aggressive, and quite therapeutic. On the palate the sweetness is right up front, coating your mouth until a wave of the bitter herbal notes make their way through. Spicy, darkly sweet and fresh with citrus rind, this is a genius combination for amaro-lovers, or anyone suffering from a cold. It’s also the perfect way to warm up a bit after a winter’s passeggiata. Salute! Meletti Cioccolato. In a word, Sinful. And don’t forget all the school of hottest alcoholic beverages. also Barolo can be drink like the China. “Barolo chinato” is one variable of this family. Grazie del consiglio! Non l’avrei mai pensato di riscaldare Barolo Chinato cosi, ma sono sicuro che mi piacerebbe molto! Wow! I must be getting old. Thanks for pointing out that error… you’re right and I will correct! Have you seen ChinaMartini in the states? I just read a cocktail recipe with it. Maybe there’s another amaro that it’s similar to? Cheers! Hmmm… No I don’t believe I have ever seen it here! Let me know if you hunt some down though!